Well, somewhat predictably, King Iván of the Pongos didn't last for very much longer. He passed on in the year 1456, aged 71. He was succeeded by his youngest son, King Vladislaus (at this point, the Pongos were still using the ultimogeniture succession law, in which the youngest inherited the title - as were the Great Tartars and New Byzantium). Because King Vladislaus was a bit mad, the alliance between the Pongos and Taurica became somewhat strained - especially after he paraded around King Alexandros's court dressed as a horse, dragging mud in from all over the place. Eventually, both the palace and the friendship were cleaned up - but, by this point, Taurica was facing severe internal problems: their mostly-Muslim population in the east were threatening to rebel, and establish a realm of their own, free from their Greek Orthodox overlords. When they did rise up, the Great Tartars offered their assistance - and, before long, the newly-independent state of Circassia was carved out of the eastern two-thirds or so of Taurica's territory. This wasn't the only place where the Great Tartars were throwing their weight around. They were alarmed by the rate at which Muscovy was gobbling up the beautiful plains to their east - and so, they launched a full-scale invasion. Muscovy were routed, and so, the Great Tartars were able to win a significant expansion of their territory. Even the Eastern Turks managed to take advantage: they recaptured a significant slice of the land which they had lost in the previous Muscovite invasion. After their massive expansion to the east, the Great Tartars didn't really bother defending the forests in the north-west of their territory: instead, they were much more interested in their newly-conquered plains, which were far better for their horses. As a result, King Łukasz II was able to march his army through these northern forests, without ever encountering much resistance. On this territory, he set up the Duchy of Lithuania: a new Polish vassal held by his son, Bolesław. The Pongos were becoming more influential too - but in a different way. In 1469, one of their clergymen - Archbishop Miklós of Esztergom - managed to get himself elected Pope, taking the name Victor IV. He was always something of a glory hound, and he had his eyes on Jerusalem - which had been heavily-contested for centuries, but which had been outside the realms of Christendom for over 200 years. 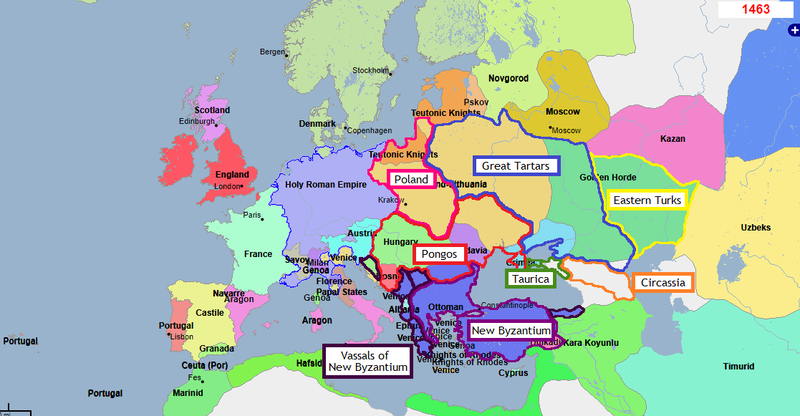 New Byzantium, too, had ambitions to expand into this area of the globe: Antioch had been one of the original patriarchates, but it had been captured by the Seljuk Turks in 1084, and now, the resurgent Byzantium wanted it back. In 1471, Archbishop Victor IV declared the beginning of the Tenth Crusade. Historians of this universe have argued for centuries whether his true motives were economic, religious, or simply expansionist - but, whatever they were, they gave New Byzantium the opportunity they needed. This conquest brought about several changes to the map. 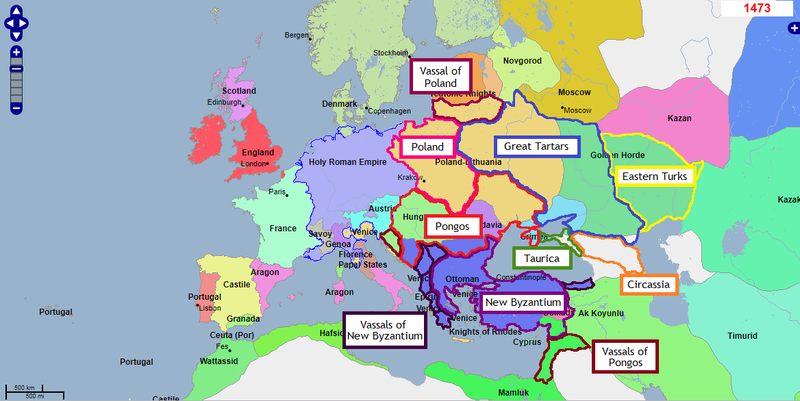 First of all, New Byzantium simply incorporated Antioch and the surrounding area into its empire. However, they recognised the importance of the Pongos in their mission to to recapture it - and, out of gratitude, they returned one of their northern vassals - the Kingdom of Croatia - to the Pongos. The most noticeable change, however, is the re-establishment of the Kingdom of Jerusalem - also a Pongo vassal. This was not, however, populated exclusively by Hungarians: while many of the Pongo crusaders settled there, they were joined by their comrades from France and a patchwork of HRE states - not to mention those locals who had been unable or unwilling to flee. So, all in all, the new Kingdom of Jerusalem was a true cultural and religious melting pot. Question is, now that this territory had been taken, could it be held?